North Adelaide, • Show map Adeaide bed and breakfast Accommodation. There are 3 suites in total at the inn, all of which feature luxurious king-size spa bathrooms. 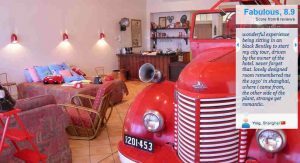 Choose between the romantic Loggia Suite, the spacious 2 bedroom Penthouse or the famous Fire Engine Suite, complete with authentic fire truck, fireman’s pole and dress-up uniforms. Breakfast can be arranged on a request basis and delivered to your suite each morning. There is also a selection of local restaurants and cafés that provide a complimentary room service. 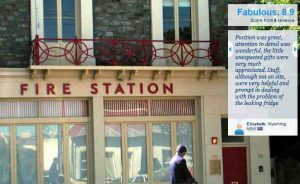 Guests staying at Fire Station Inn can make the most of the complimentary shuttle bus that runs from the CBD past the fire station. Alternatively, the CBD can be reached with a 25-minute walk. More hotels around Adelaide Australia that match your search criteria: Adeaide bed and breakfast Accommodation. Lyndoch ( 46.7 km from Adelaide ) • Show map Adeaide Australia bed and breakfast Accommodation. Unlike the other state capitals of Australia, Adelaide has never been a convict settlement, and was settled entirely by free settlers since its founding. Montefiore Hill, in North Adelaide provides a spectacular view of the city, especially at night. Adelaide Hills, including the Mt Lofty Summit provides spectacular views of the Adelaide plains, Adelaide metropolitan area, Adelaide CBD, Glenelg and surrounding areas. Hahndorf, German settlement, a short drive up the freeway, attractions include a small chocolate factory, the Beerenberg Strawberry Farm, parks with barbeque facilities and a playground plus many small stores selling all manner of products. Other lookouts include Windy Point along Belair Road, and Skye at the end of Kensington Road. One of the best times of the year to visit is during “Mad March”, when a multitude of festivals and events are held. These include the Adelaide Fringe, the Clipsal 500 Car race, the Adelaide Festival, WOMADelaide, The Adelaide Cup horseracing carnival and the touring Soundwave and Future Music Festivals. Also, you can see interesting Museums and National Parks, such as Belair National Park and Cleland Conservation Park. Although it lacks the picnic and sports facilities of Belair, Cleland offers greater opportunities for tourists to get up close and personal with Australian native fauna. Visitors can feed and wander at their leisure among kangaroos, wallabies, emus and waterflow. Displays of dingoes, reptiles, Tasmanian devils, wombats, echidnas and koalas allow easy viewing access, or stroll through the aviaries. Gouger Street offers a wide range of tastes to suit many budgets in a variety of Asian, Italian and seafood restaurants as well as unmarket French, Argentinian and many other choices. Also, incorporates Adelaide’s “Chinatown Arch” which fronts a large number of budget eating options. As well as The Central Market, which on Tuesdays, Thursdays, Fridays and Saturday mornings are buzzing with produce traders, sights and smells. In North Adelaide you can find an eclectic mix of small restaurants and cafes make Melbourne Street an interesting place to eat. The Adelaide Australia Central Market is a must see if you are in the area. It is located between Gouger and Grote Streets right next to China Town. It’s open Tuesday, Thursday, Friday and Saturday. You can buy nearly anything there – fresh and prepared foods, as well as souvenirs and clothes. And there are a number of food courts as well as cafes and restaurants there too. Adelaide is a gracious city and an easy place to live, and despite its population of around one million, it never feels crowded. It’s a pretty place, laid out on either side of the Torrens River, ringed with a green belt of parks and set against the rolling hills of the Mount Lofty Ranges. During the hot, dry summer the parklands are kept green by irrigation from the waters of the Murray River, upon which the city depends, though there’s always a sense that the rawness of the Outback is waiting to take over. The original occupants of the Adelaide plains were the Kaurna people, whose traditional way of life was destroyed within twenty years of European settlement. After a long struggle with Governor John Hindmarsh, who wanted to build the city around a harbour, the colony’s surveyor-general, Colonel William Light, got his wish for an inland city with a strong connection to the river, formed around wide and spacious avenues and squares. Postwar immigration provided the final element missing from Light’s plan: the human one. Italians now make up the city’s biggest non-Anglo cultural group, and in summer Mediterranean-style alfresco eating and drinking lend the city a vaguely European air. Not surprisingly, one of Adelaide’s chief delights is its food and wine, with South Australian vintages in every cellar, and restaurants and cafés as varied as those in Sydney and Melbourne. Adelaide may not be an obvious destination in itself, but its free-and-easy lifestyle and liberal traditions make it a fine place for a relaxed break on your way up to the Northern Territory or across to Western Australia. Take A Break Holidays takeabreakholiday, Adelaide bed breakfast Accommodation.